The latest title update (1.05) for NBA 2K17 is now available on PC, PlayStation 4 and Xbox One. 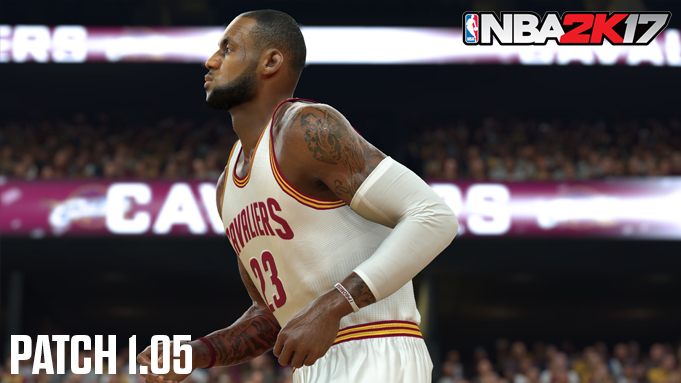 In addition to the patch, 2K has also released a new roster update to reflect all the trades and recent transactions. The full patch notes are posted on 2K's social media, but for your convenience you can just give 'em a look down below. HDR support has been added for the PS4. Support for the PS4 Pro has been added. NBA 2K17 will run at a native 4K resolution at 60 FPS on the Pro. The Cleveland Cavaliers court floor has been updated to match their new 2016-17 design. The Golden State Warriors uniforms now have the #42 patch in honor of the late Nate Thurmond. Authenticity improvements to a large number of uniforms. You can now use post-release uniforms in Play Now games when using a custom roster. Post-release shoes will now dynamically appear in your game mode saves when starting a new mode or when using a custom roster created after October 15th. Users now have the ability to toggle off the ‘Zoom in Paint’ camera option when using the default broadcast camera. Fixed an issue where the user was unable to unequip certain animation types from their MyPLAYER. The user can now unequip socks from their MyPLAYER. Addressed an issue where controller settings would reset after played games online. Users will no longer be able to prolong MyTEAM Blacktop games by committing reach-in fouls. The Jamal Crawford double behind-the-back combo size-up move now functions properly when equipped. Aiming should now be much easier in the broadcast camera for users who use Pro Stick shot aiming. Disabled shot timing for all shots (including layups, hooks, floaters and heaves) when Shooting Type is set to Real Player %. Improvements to make catching short passes more reliable. Dial back pass speeds (especially on longer passes) to achieve better game balance. “Soften” top front rim ball bounces for more realistic physics-based outcomes. Reduced the frequency of “ticky tack” shooting fouls on jump shots and layups. Fixed illegal screens, which were not being triggered in the proper situations. General improvements to responsiveness, primarily in offball motion. Improvements to the CPU’s double team logic and general defensive AI decision making. Addressed a visual issue that would sometimes cause hook shots to branch into jumpshot follow through landing poses. Teams in Rivet City are again able to grab a Got Next spot while a game is in progress. Fixed a hang that occurred to some users when they were hopping from one MyPARK to another. Fixed a number of camera-related issues when shooting free throws during Pro-Am games. Addressed an issue where some users were unable to use their custom jumpshot in MyPARK. When editing your Pro-Am court, the backboard logo and wall texture can now be switched back to none/blank. You can now view the team rosters of each team directly from the Power Rankings menu in Pro-Am. All of your teammates will now have a unique color indicator when playing Pro-Am. Grand Badges will now appear on the 2K Card in both MyPARK and Pro-Am. You can now skip through story scenes that you have already watched. Fixed an issue that would result in the user being unable to play their next game in MyCAREER (a restart is required if you are affected by this). Fixed a case where some users were not seeing triggered story scenes. Fixed an issue where some MyCAREER sponsor contracts were not rewarding the user with the correct amount of VC. Corrected an issue where you could not purchase/equip shoes from your new company when switching shoe endorsements. Addressed an issue where the phone in MyCAREER would inform the user of a new message when that was not the case. Fixed a case where the player would get stuck in the line during the Free Throw Golf drill in Live Practice when using specific signature animations. Points of Emphasis have returned to the Gameplan feature! Note that these only affect simulation results. The Advanced Rotations feature will now scale all rotations to work regardless of your chosen quarter length. Fixed cases where some approved city names (e.g. Buffalo) were not being permitted through the content filter when moving your team to another city. Fixed an issue where player attributes were being slightly modified when loading a draft class after the first season. Injuries will now occur during head-to-head gameplay in MyLEAGUE Online. Color improvements have been made to the Kansas City Knights uniform. Fixed a hang that would occur when attempting to use SimCast on the Rising Stars game. Expansion teams will no longer get unlimited funds in MyGM. The NBA logo is now located in the correct spot on the shorts when creating a custom uniform. This patch is now available on all platforms weighing at 4.42 GB.